As a leading developer and manufacturer of science-based, clinically relevant, hypoallergenic supplements, Pure Encapsulations is committed to providing bioavailable nutritional supplements that optimize long term health and wellness. All ingredients are selected on the basis of quality and purity and are provided in their most bioavailable forms by trusted suppliers from the U.S., France, Japan, Switzerland, Germany and Italy. Ingredient providers must meet rigorous testing and quality criteria to qualify as a supplier. No added coatings, fillers, binders, artificial ingredients or excipients are ever utilized in their hypoallergenic formulas. All products are manufactured in their own state-of-the-art GMP certified plant and are tested by certified independent laboratories. Independent microbiological testing ensures purity, safety, efficacy and potency. 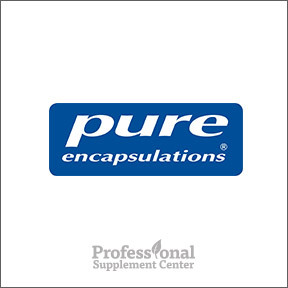 As Pure Encapsulations recognizes the importance of the guidance of a qualified health care professional, their high quality supplements are available only through licensed health care practitioners. B Complex Plus – This exceptional combination of B vitamins provides nutrients in optimal bioavailable forms. B vitamins support hemoglobin formation, nervous system function, hormone synthesis and energy metabolism. Gluten and soy free, non-GMO vegetarian formula. L-Glutamine 1,000 mg – This product nutritionally supports the mucosal lining and the healthy functioning of the gastrointestinal tract. L-glutamine provides an important energy source for the GI tract, especially during stress or increased metabolic demand. Gluten and soy free, non-GMO vegetarian formulation. UltraNutrient – This advanced formula provides broad spectrum nutritional support with core vitamins and minerals along with antioxidants and standardized phytonutrient extracts. UltraNutrient provides enhanced antioxidant, cardiovascular and liver support. Gluten and soy free, non-GMO vegetarian formula. NAC 600 mg – This free-from amino acid delivers powerful antioxidant support and specifically supports immune and respiratory health and plays a role in heavy metal detoxification. One capsule provides 600 mg of extensively purified NAC along with 5 mg of Vitamin C. Gluten free, non-GMO vegetarian formulation. Alpha Lipoic Acid 600 mg – ALA is a multifunctional, versatile nutrient that supports metabolic processes and provides antioxidant protection from free radicals. ALA promotes healthy vascular and blood vessel function and supports healthy glucose metabolism. Gluten and soy free, non-GMO vegetarian formula. This entry was posted in Home and tagged 000 mg, Alpha Lipoic Acid 600 mg, B-Complex Plus, L-Glutamine 1, NAC 600 mg, Pure Encapsulations, UltraNutrient. Bookmark the permalink.